Manufacturers use a wide variety of plastics to mold parts incorporated into products and have increasingly begun to replace other materials like bronze, stainless steel, aluminum, and ceramics. Some of the most popular reasons for using or switching to plastic include longer overall lifespan of the part, reduced wear on other components of a product, faster production line speeds, corrosion resistance and weight reduction. In addition, companies report an average 25-50 percent cost savings when parts are converted to plastic which oftentimes exhibit superior performance attributes. Aligning with your injection molding partner to choose the best resin early in the design for manufacturability process, is crucial to a part’s production success. A good place to start is to have a general understanding of the two main types of resins – amorphous and semi-crystalline. Polymers are made up of structures that are defined in terms of crystallinity – or how the molecules of the polymer are packed together. Crystalline structures are in most cases very ordered, which gives the material strength and rigidity. Amorphous polymers are the opposite. Sometimes the distinction between the two is not clear cut. With most polymers, there is a mix of both crystalline and amorphous structures. How the polymer is processed determines the exact proportion of each. 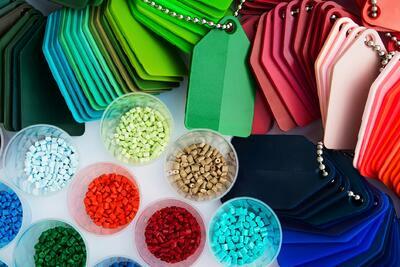 Amorphous resins include most clear plastics including polycarbonate, acrylic, PETG, ABS, and polysulfone. They are a high temperature family of resins that can often be substituted for one another, in the same injection cavities, since the linear shrinkages are in the same range. Semi-crystalline resins have a highly ordered molecular structure and do not soften as temperature rises, but rather have a defined and narrow melting point. The melting point is generally higher than the upper range of amorphous thermoplastics. Some of the most common semi-crystalline plastics include Nylon and Acetal. When flexibility is needed at low to ambient temperatures, amorphous polymers are the best choice for your application. When hardness and rigidity are required, polymers with greater crystallinity is recommended. In addition to the more commonly used amorphous and semi-crystalline resins, there are high-heat / exotic resins that offer unique properties and characteristics that make the specific material ideal for various part characteristics and applications. A part’s overall appearance and geometry have a significant impact on the molding capability and the type of resin that should be used. Part design including size, shape, and wall thickness can make a part prone to defects, while features like snaps, undercuts, bosses, ribs and more can complicate the molding process. Identifying the potential risks for part defects before the production process is an essential step in injection molding. It is imperative that injection molders use the latest technology to run simulations validating the design and resin choice before the project is finalized for production. SolidWorks®Premium plastics flow simulation provides predictive insight in the early stages, which often reduces overall time to market. Material selection plays a critical role in the strength and flexibility of your molded part. Addressing specific needs early in the design process can help you avoid costly changes later. Balancing characteristics like stiffness, durability, toughness, and others are key in achieving optimal part functionality. Additionally, it’s important to understand the key differences in some of the more commonly used resins. ABS (acrylonitrile butadiene styrene) is a common injection molding material that can be sourced and molded relatively easily, at an accessible price point. It’s a strong, sturdy material that offers good impact resistance, is easily machined, and meets a variety of aesthetic requirements. The resin is not ideal for parts that will be subjected to sustained intense heat as it will warp or melt above / around 200 degrees Fahrenheit. Polycarbonates are a high-grade class of thermoplastics that are easily molded and often increases shatter resistance. Naturally transparent, polycarbonate is ideal for high-strength glass-like applications (safety goggles, medical lab applications and more). Polycarbonate isn’t suited for applications where a higher degree of flexibility is needed or colored aesthetic choices. Glass-filled nylon is a reinforced thermoplastic, where the base nylon resin has glass fibers added to it for extra strength and heat resistance. This resin is also more nonconductive to electricity than many others, but despite of its high melting point, it is more susceptible to burning than other materials. Polypropylene is a flexible thermoplastic that is suitable for industrial and consumer applications. It’s known as being a highly pliable resin that can be manipulated in many ways without losing its original shape. Polypropylene also offers resistance to solvents, chemicals and UV rays. Acetal is known to provide great friction resistance and is a highly rigid material. It can be easily colored and dyed in the molding process; however, does not offer superior heat resistance. Understanding the conditions and environmental factors a part will be exposed to is an important consideration in the design and resin selection process. Physical, chemical, and thermal environments are likely the most important to keep in mind. Many resins are at risk for degradation when exposed to radiant and ultraviolet energy which can cause a breakdown of the material. Extreme temperature, humidity, radiation, and other environmental factors including the possible need for fire resistance, are all factors that should be taken into account. Knowing the environment for a part will simplify choosing the best resin when you consider each material’s unique attributes and benefits. Product regulatory requirements can pose unique challenges during the plastic injection molding and resin selection process. Often parts must pass requirements before they are released to go to market. These may include compliance with ASTM, ANSI, OSHA, FDA, EPA and more. When material performance cannot be achieved with available resins, custom blends of materials can be created to boost the properties of multiple resins. Reinforcing materials with additives can build strength into parts and add stiffness that may reduce warping and shrink. Additives like glass or carbon fibers can be used to enhance part performance and improve flow, ejection and dispersion. One of the most vital steps when preparing for injection molding resin selection is to create a comprehensive material selection list of requirements for the product. The list should most certainly include price target and resin availability – as resin availability can be a risk and backup resin choices should be considered. The types of resins available, part appearance, part strength, environmental factors, regulatory requirements, and if an additive will be needed – are all important considerations that should be weighed carefully before beginning an injection molding project. In addition, it’s always best to review specifications for generic versions of polymers, as the characteristics of these materials may be a good fit for your application. Are you beginning a project that will require the help of an experienced plastic injection molder? Learn how Plastic Components, Inc. will strive to be your best supplier and a team you can count on.